Animals cartoon: What's in a name? 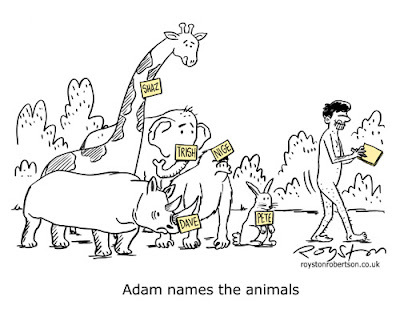 I spent an inordinate amount of time deciding on the names for the animals in this cartoon, which can be seen in the October issue of Reader's Digest. Click the image to enlarge it. They had to be fairly ordinary names, the type that people have, rather than the names people give to animals. Yet it still took time deciding which one would be Pete, which one Trish, etc. Thinking up names for characters in single-frame cartoons is always tricky because they have to work just once. You can't come up with a name that the readers will get used to over time, as with a comic strip. By the way, if I know you personally, and you have the name of any of the animal characters above, please don't take offence! Any similarity to real persons living or dead is purely coincidental. I just thought I'd better point that out. I've not had much time for blogging lately, so instead here's a recently published cartoon about blogging. 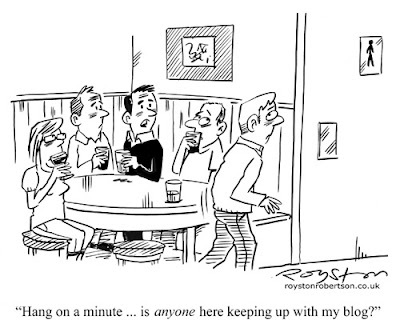 There are bloggers who, like the deluded fool in this cartoon, believe that people they know are hanging on to their every word via their blogs. But, of course, with a hundred gazillion other blogs to choose from, not to mention other websites and distractions, you can never assume that anyone gives a stuff. Hang on a minute ... is anyone reading this? 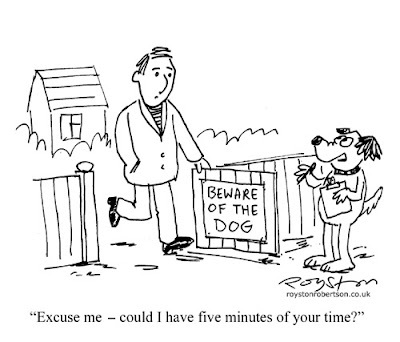 Over the years I have done many cartoons on the subject of cats and dogs, including the one above which was in Private Eye in 2004. So when I came to do a revamp of my portfolio site recently I decided to create a gallery exclusively consisting of cat and dog cartoons from various publications, for all you pet lovers out there. Here it is: Cat and Dog Cartoons. Enjoy (I hope no one's allergic?). It's been more than a year since I've updated the content on my portfolio website (click screenshot above to enlarge), but I finally got around to it this week. 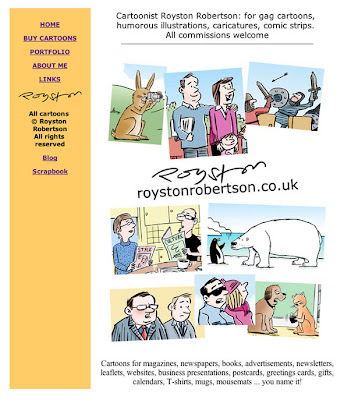 I have added lots of magazine cartoons from the last year, as well as examples of cartoons and illustrations for books, leaflets, websites etc. that I have done recently. There's no major revamp but I have simplified the site a bit. Whereas before each gag cartoon had its own page, I figure that in this broadband age you can put several on one page.